Practice Python questions and answers for interviews, campus placements, online tests, aptitude tests, quizzes and competitive exams. This set of Python Multiple Choice Questions & Answers (MCQs) focuses on “Shallow copy vs Deep copy”. 1. Which type of copy is shown in this code? Explanation: The code shown above depicts shallow copy. For deep copy, the command given is: l2 = l1.copy(). 2. What is the output of the code shown below? Explanation: The code shown above depicts deep copy. In deep copy, the base address of the objects is not copied. Hence the modification done on one list does not affect the other list. 3. In _______________ copy, the base address of the objects are copied. In _______________ copy, the base address of the objects are not copied. Explanation: In shallow copy, the base address of the objects are copied. In deep copy, the base address of the objects are not copied. Note that memberwise copy is another name for shallow copy. 4. The nested list undergoes shallow copy even when the list as a whole undergoes deep copy. State whether this statement is true or false. Explanation: A nested list undergoes shallow copy even when the list as a whole undergoes deep copy. Hence, this statement is true. Explanation: The code shown above depicts shallow copy and the output of the code is: [1, 2, 3]. 6. What is the output of the codes shown below? Explanation: The first code shown above represents shallow copy. Hence the output of the expression id(l1)==id(l2) is True. The second code depicts deep copy. Hence the output of the expression id(l1)==id(l2) in the second case is False. 7. What is the output of the code shown below? Explanation: The code shown above shows a nested list. A nested list will undergo shallow copy when the list as a whole undergoes deep copy. Hence the output of this code is False. 8. What is the output of the code shown below? Explanation: The code shown above depicts deep copy. Hence at the end of the code, l1=[10, 20, 30, ] and l2=[10, 20, 30, ]. In ____________________ copy, the modification done on one list affects the other list. In ____________________ copy, the modification done on one list does not affect the other list. Explanation: In shallow copy, the modification done on one list affects the other list. In deep copy, the modification done on one list does not affect the other list. 10. What is the output of the code shown below? Explanation: In the code shown above, the list l1 is enclosed in a tuple. When we print this list, it is printed as [1, 2, 3, 4]. Note the absence of the tuple. The code shown depicts deep copy. Hence the output of this program is: l1=[1, 2, 3, 4] and l2=[1, 2, 3, 4]. 11. What is the output of the piece of code given below? Explanation: The above piece of code checks recursively whether a number is even or odd. 12. What is the base case in the Merge Sort algorithm when it is solved recursively? Explanation: Merge Sort algorithm implements the recursive algorithm and when the recursive function receives a list of length 1 which is the base case, the list is returned. 13. What is the output of the following piece of code? a)	1 2 3 4 5.
d)	Error, lambda functions can’t be called recursively. Explanation: The above piece of code appends the first element of the list to a reversed sublist and reverses the list using recursion. 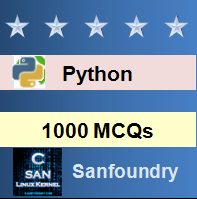 Sanfoundry Global Education & Learning Series – Python. To practice all areas of Python, here is complete set of 1000+ Multiple Choice Questions and Answers.